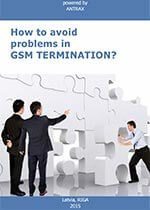 View topic - How to avoid problems in GSM TERMINATION? What will you learn in this white paper? Why do we need a SIM Box? be produced by one manufacturer? How to make your route better? How to purchase SIM cards? “Keep your money in a bank and your SIMs in a SIM-bank. VoIP signal to GSM and SIM-bank which holds sims and controls their work. with no need of putting sim into each of them. This reduces expenses for system maintenance.